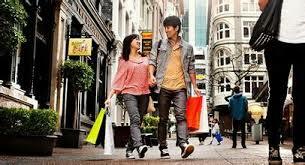 Buying is one of the most favorite activities of Chinese when travelling. According to recent statistics, Chinese travelers are increasingly turning down group trips to go on an adventure of their own. Their travel habits are also changing. They seem to have more sense of adventure and want to increasingly immerse themselves in the culture of the countries they visit. Moreover they are also less prone to shopping sprees and increasingly eager to have some unforgettable experiences regardless of where they go. “The Chinese market has the most experienced travelers, who made enough trips to Hong Kong and Macao and purchased enough watches and bags. They now want to explore the beaches, temples … some exotic culture and culinary things “according to John Svanström, general manager of Hotels.com Asia Pacific, told China Daily. Fortune Institute characters based in Beijing also believes that Chinese tourists spend 40% of their travel expenses for luxury shopping. They predict that this will be reduced to 20% in the next five years, however. It’s not necessarily that Chinese tourists are spending less on purchases, but rather than spending in other areas will substantially increase. Young people are more adventurous. Here adaptation is the key to keeping its edge over the competition. It seems that the Chinese tourist overcomes his fears, his doubts to prefer unforgettable adventures. Chinese tourist has become much more open to multiculturalism than before. Should we simply follow the trend or anticipate it? Whatever your offers and strategies are, you must of course include a good digital marketing campaign to reach this population which is strongly connected. Indeed, the Chinese spend almost 21 per week on internet. So it’s more than 600 million Chinese Internet users connected on average 21H per week which you will have access to with this kind of campaign. It is worth it, isn’t it? I would not put too much trust into the results of the hotel.com survey, the bias stemmed from the research method is big. Nevertheless indeed Chinese outbound tourism is diversifying and segmenting, as well will show on the 27th Sept. 2014 in the COTRI / Dragon Trail / GBTIMES organised TWELVE HOUR continuous free webinar about Chinese outbound tourism around the world. See http://www.WelcomeChinaGlobalWebinar.com. Please join, it is free, and share your experience with the New Chinese Tourists in the Q+A sessions. We’re a fresh thinking, experienced Moroccan Tour Company. Offering tours and authentic holidays to Morocco. Explore the hidden treasures of an ancient land, and discover the exotic sights and culture of this fascinating country.